Home » arsenal , Bayern Munich , Christian Lell , England , Germany , john terry , Mesut Ozil , Sami Khedira , social media » Playing Away: Is Mesut Ozil the New John Terry? Arsenal and German midfielder Mesut Ozil was in the news this week when former Bayern Munich player Christian Lell accused the World Cup winner of 'muscling in' on his relationship with Melanie Rickinger. Ozil, who is dating pop star Mandy Capristo, may have been playing away from home like Chelsea's "Captain, Leader, Legend" John Terry who famously had a filthy fumble behind his wife's back with teammate Wayne Bridge's girlfriend. In an interview with Bild, Lell referred to his now ex as a 'snake' and went on to tell the tabloid that she had swapped dirty messages with Ozil over the messaging service WhatsApp. "Mesut exploited his fame, and muscled in on our relationship," said Lell. 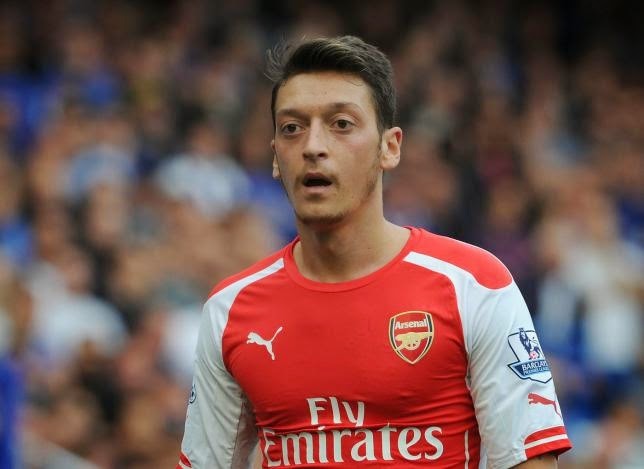 "That isn't OK."
Ozil's agent, Roland Eitel, fired back that, "We are not commenting on this. We will keep an eye on the situation, and take legal action if necessary." With the Arsenal player himself not offering any comment, Rickinger has said that Lell is 'crazy' and looked at her WhatsApp messages without her permission. She didn't go as far as to deny the rumours of impropriety with Ozil however. As for Capristo, who is currently a judge on the reality show, 'Germany's Search for a Superstar', like her partner she has also refused to comment. It's been a tough few weeks for Ozil, as he recently suffered a knee injury that will keep him out until the new year and it was reported last week that he might be considering a move away from Arsenal after growing disillusioned with Arsene Wenger playing him out of position. With rumours of Bayern Munich considering a £30 million swoop for the player in January, the Gunners may consider it as Ozil has struggled at times in North London and the club is keen on freeing up funds so they can go in for his Germany team-mate Sami Khedira.